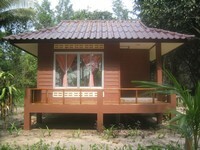 We offer different categories of Bungalows - from simple bamboo Bungalows to exclusive Bungalows. The prices are 300, 500, 800 and 1,000 Baht. 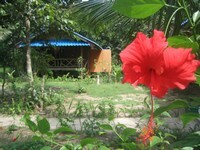 The Bungalows are directly on the beach and build for 2 persons. 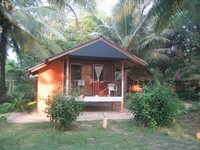 Each bungalow has a Bathroom with a Toilet and Shower, a small balcony and a bed with a mosquito net. Surrounded by a beautiful garden with many coconut palms - it is the right place to relax and enjoy nature. Electricity is produced by a generator and starts at 6:00 PM to about 11:00 PM. Take a look at the Gallery ! You would like to stay longer? No Problem ! Beach Front Bungalow including kitchen usage for only 10,000 Baht per month (Minimum rent 1 Month). Please contact Pom at the Resort.